When I helped to form the Pride Fund to End Gun Violence, our goals were clear and, we thought, attainable. Forty-nine innocent people had just been murdered at the Pulse nightclub in Orlando. We thought “who could be against making sure that devastating weapons like the Sig Sauer MCX are kept out of such hate-filled hands?” was a rhetorical question. The NRA and its minions are organized and implacable. There is no tragedy or argument that can make them change their opinions one iota. Standing up to them takes an iron will. That is why endorsing Lindsey Davis Stover was an easy choice. She is running for Congress against Barbara Comstock (R-Va.) in Virginia’s 10th District, one of the most winnable districts for the Democrats in the 2018 election. Lindsey has exactly the attributes we need in a Congresswoman to help finally bring needed changes to our gun laws. She’s courageous. She’s a hard worker. She can talk to everyone and discriminates against no one. And she knows how important it is to keep guns out of the hands of violent offenders, domestic abusers, suspected terrorists, and the dangerously mentally ill. I consider her a friend not just to me, but to the entire LGBT community. It almost goes without saying, but if people like Barbara Comstock stay in Congress, we can forget about common sense gun laws. We can forget about background checks, restricting access to assault weapons, or even preventing people convicted of hate crimes from purchasing guns. Comstock flaunts her “A” rating from the NRA. She agrees with the NRA that guns belong in bars, the workplace, concealed on people’s belts, and who knows where else. She agrees with the NRA that people shouldn’t need to pass a background check before they buy a gun. I served America in Iraq, and I’m proud of my service. Unlike so many gun “rights” advocates, I actually know how to use these automatic weapons. And I actually know how much destruction they can cause, how many lives they can end. I know better than the NRA that these weapons have no place on America’s streets. My time in Iraq also taught me what a friend looks like. It taught me to recognize the people who will fight alongside you and believe in you, regardless of your sexual orientation or gender identity. Lindsey Davis Stover is that kind of person. She is that kind of friend. 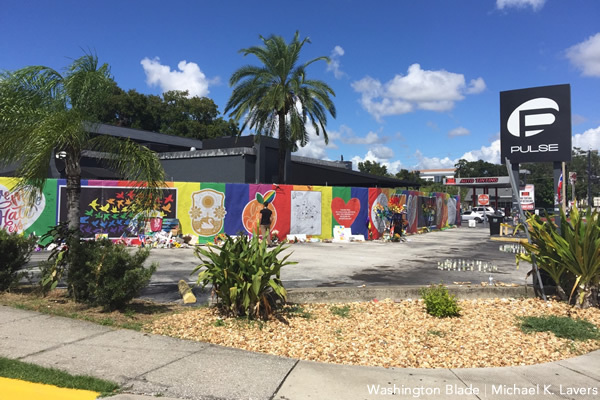 June 12 will mark the one-year anniversary of the Pulse massacre. Since that time, more than 31,000 people have died in America from the epidemic of gun violence. We must act together to save lives. This anniversary stirs up difficult memories within the LGBTQ community, all while reminding us of the important fight ahead. Pride Fund is solely in existence to ensure that the best elected officials are at the table protecting all Americans. On the issues, we operate at the intersection of commonsense gun reform and LGBTQ equality. Both issues are important to creating a safe and just society. To advance these issues and effect lasting change, we must only elect candidates who demonstrate leadership on both fronts and we must change the balance of power at the state and federal levels. That is why we support Lindsey Davis Stover. Jason Lindsay is executive director of the Pride Fund to End Gun Violence, pridefund.org. “…I actually know how to use these automatic weapons.” That you may but you must not know the difference between an automatic weapon and a semi-automatic weapon. The Blade is now required by FEC and FCC regulations to publish endorsements for other candidates competing for the same federal office. Lindsey Davis Stover believes victims of hate crimes who have had and passed background checks, had training and have gun safes, should not even be able to keep and bear firearm for basic self defense. What do you think supporting DC in Heller means?